Kasey Barker is working full-time as a Certified Flight Instructor for MGA while finishing up his bachelor's degree. High School: Dacula High School. Family: Edwin Barker (father), Kathy Chastain (mother), Kyle Barker (brother). Employment: Certified Flight Instructor for MGA's School of Aviation. Career Goals: "Like most MGA graduates from this program my end goal is to work for a major airline within the next 10 or so years. Meanwhile I plan on working for the University to build enough flight time in order to hold a first officer position at a regional airline, such as ExpressJet or Republic Airways." 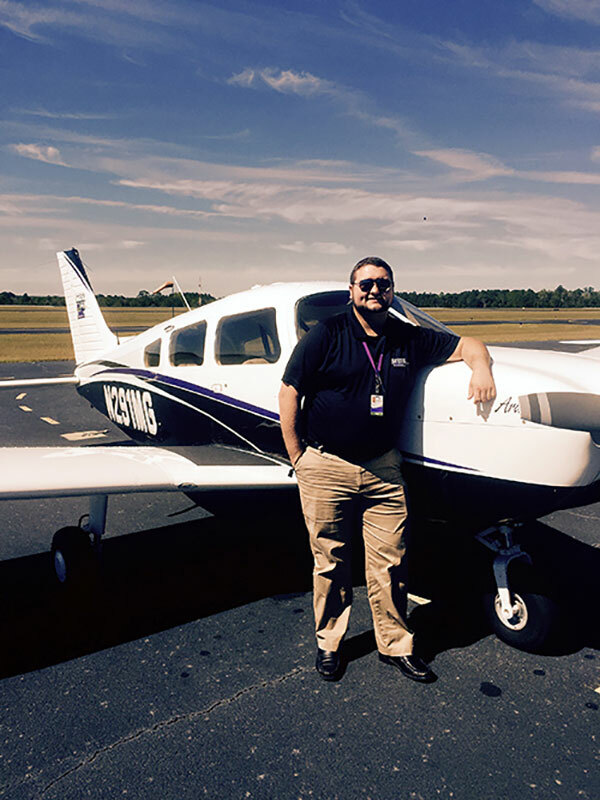 He chose Middle Georgia State University because … "I was looking for an affordable way to reach my dreams as a commercial pilot and found that MGA was the way to get there. Its location in the Middle Georgia region provided an excellent training environment to build and sharpen my piloting skills at a reasonable cost." The greatest thing he discovered about Middle Georgia State was ... "The overall atmosphere of the program. The staff and faculty at the aviation campus really put their best into helping me reach my goals in the flight program." His greatest academic experience so far as a Middle Georgia State student has been … "Being able to work full-time teaching students how to fly while finishing my senior year at MGA. It's very rewarding to be able to give back and bring up the next generation of pilots while watching the school grow into a competitive aviation program." To him, greatness means … "Striving to be the best that you can be without needing any extra incentive and going beyond what you normally would do to help others or yourself to achieve a higher personal goal." In five years ... "Within the next five or so years after graduation, I see myself holding a first officer position at a regional airline such as Expressjet or Endeavor Air."